Windows has the ability to change wallpapers or background pictures on your computer at random, but sometimes you need a little bit more convenience and control. One program I use is Wallpaper Randomizer, from Sector Seven. 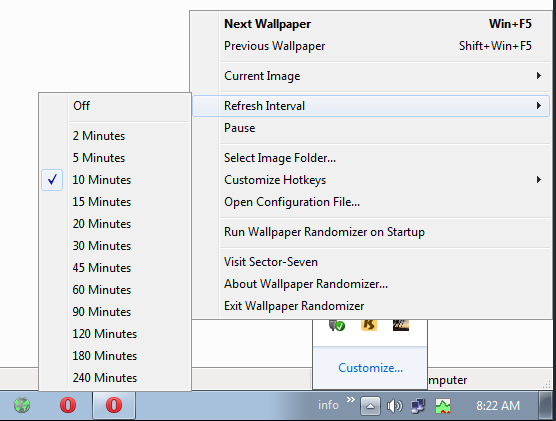 Wallpaper Randomizer is a small System Tray wallpaper changer. It is also free and portable– no installation needed. When you first download and run it, it asks you for the folder where you store your background images (aka, Wallpaper). Once you choose your folder, it minimizes to your System Tray (down by your clock). Right-clicking the icon gives you the options for the program. I have the program set to change the background every 10 minutes but sometimes this doesn’t happen and it will occasionally get stuck on certain pictures. I have a folder on my hard drive with pictures only for backgrounds on my desktop and have Wallpaper Randomizer set up to access that folder. Wallpaper Randomizer will pick a picture at random, copy it to it’s own program folder, convert it to a .bmp (Bitmap) format and set it up as your wallpaper/background. In my case, it ran into three different pictures that it had trouble with. When the program stopped working I noticed it had two copies of the picture in its folder instead of one, but the second picture was a .jpg format. Also, when the program couldn’t change the picture, I noticed the shortcut key to change pictures, in my case, Windows Key + F5, didn’t work, either. I found a simple solution. I went to the program folder and and just deleted both images, then I pressed the Windows Key + F5 to load the next image. I sent an eMail to the developers and they were not aware of the issue. We both agree that it might be a glitch with my pictures and not with the program since it seems to stall on the same pictures. It recently happened again to a completely different picture. If you use Windows Randomizer and this happens, you’ll now know how to fix it.